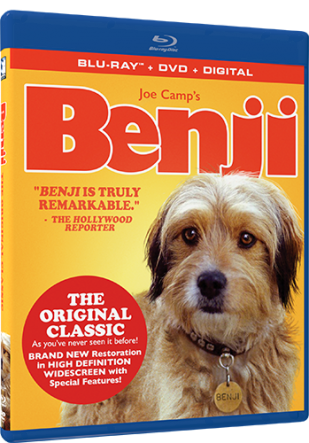 I was so excited when I heard that the folks at Mill Creek Entertainment were releasing Joe Camp's original classic, Benji, to DVD, Blu-Ray and Digital, as I knew two little girls would love this this wonderful movie. Like I have shared in past blog posts, both of my girls are huge dog lovers. Savannah I have to say is the biggest fan as she can't leave the house or go to bed without wearing some work of dog outfit or accessory. I have lost count on how many puppy/doggy pants and shirts she has. And, don't get me started on socks and underwear. :-) I have talked about Benji with the girls before -- usually when I see a dog that looks like the famous pup. And, just the other day we were watching Annie from my childhood and Bella said that dog looks like Benji. I couldn't believe she remembered the dog and matched its likeness to the dog in the movie we were watching. The very next day the new Benji movie arrived on our doorsteps, and put a smile on the girls face. I, too, was excited as I haven't seen this movie is years, and was up for sharing it with my girls for the first time. Benji is a classic movie that will continue to warm the hearts of those both young and old who sit to watch this classic film. We have come a long with dog movies, as most of the dog movies I watch now with the girls, the dogs are talking. But, when you sit to watch Benji, you can't help but fall in love all over again with the simple story, and oh so adorable floppy-eared pup. "The movie that catapulted Benji into international stardom. The #3 movie of the year in its original release. A unique motion picture all told from the heart and soul of a dog. Benji is the gripping story of a vagabond dog struggling to communicate something he’s seen to humans. Humans who need to know but cannot grasp the concept that a dog could possibly help. A story of frustration and persistence, of love and suspense. And the first time ever that a dog has actually acted on the screen. Expressed emotion. And done it so very well that we, the audience, completely understand everything Benji is thinking and doing, every turn and twist, without a word of dialog being spoken." FIRST TIME AVAILABLE IN HD & ORIGINAL WIDESCREEN ASPECT RATIO! Benji was one of the best movies ever!